Car Is King Weekend At Maryhill Museum. Classic to Vintage Its’ There! And if you can’t get enough of cool cars, the Maryhill Museum is home to “Car is King Weekend” on Saturday and Sunday. 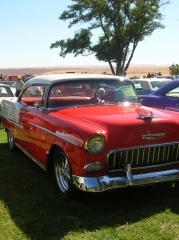 Take in vintage cars in Goldendale. On Sunday, watch sports cars from the 1930s to 1960s race in a three-mile timed race up the historic Maryhill Loops Road. For more information, call 509-773-3733 or visit www.maryhillmuseum.org. Car is King Weekend pays tribute to autos past and present with an open car show, races for kids and the highlight of the show – the grand entry of the vintage race cars competing in the Hill Climb race on Sunday. On Saturday, the Maryhill Café will be available inside and out with food and drink. Saturday, October, 10 a.m. to 4 p.m. The museum’s east lawn is transformed into the Concours de Maryhill with dozens of classic, sport and customized cars on view, competing for prizes such as best original, classic, hot rod and muscle car. This is an open car show and anyone with a special car may enter. The day concludes with the presentation of the car show awards. Organized by the Goldendale Motorsports Association. Saturday, October 1, Noon to 2 p.m. In honor of museum founder Sam Hill, the historic Maryhill Loops Road will be opened for automobiles and the public is invited to take a spin down this majestic byway – one of the first modern roads in the Northwest. 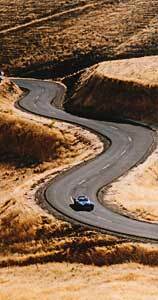 This magnificent drive features beautiful scenery and eight hairpin curves. FREE. Join in the fun at the annual Classic Veggie Car Races just for kids. Children can put their ingenuity to work transforming humble veggies into fantastically engineered cars and race them on a 12 foot ramp for thrills and chills. Kids of all ages are invited to participate in this fun outdoor activity. Races start at 1 p.m.
Sunday, October 2, 9 a.m. to 5 p.m.
Vintage sports cars from the 1930s to 1960s race singly in a three-mile timed race up the historic Maryhill Loops Road. Spectators can view the hill climb race from the Highway 97 Overlook and from designated viewpoints along the race route. Organized by the Society of Vintage Racing Enthusiasts of Seattle; only their approved cars and drivers will be competing.